This month our featured storytellers create books primarily for teens. Jillian is a cartoonist and illustrator. She grew up in Calgary, and currently lives in Toronto, Ontario. She has been a professional illustrator since 2003, when she graduated from the Alberta College of Art and Design. Jillian does lots of different stuff: magazine and newspaper illustration, book covers, posters, packaging, even a few storyboards for the TV show Adventure Time. She’s also taught illustration at the School of Visual Arts and Parsons in New York. Learn more about Jillian on her website. Mariko is a Canadian writer living in California. She has an avid interest in freaks, weirdos, and other fabulous forms of human behaviour. In the past, Mariko has appeared on stage with a variety of performance troupes, including fat activists Pretty, Porky and Pissed Off. She has recently begun writing for Marvel and DC Comics. Visit Mariko’s blog! The Tamaki cousins are the co-creators of the graphic novels Skim and This One Summer, which won a Caldecott Honor in 2015. This month, enter to win a copy of This One Summer, donated by Groundwood Books, and a Freedom to Read Week poster, illustrated by Jillian Tamaki. 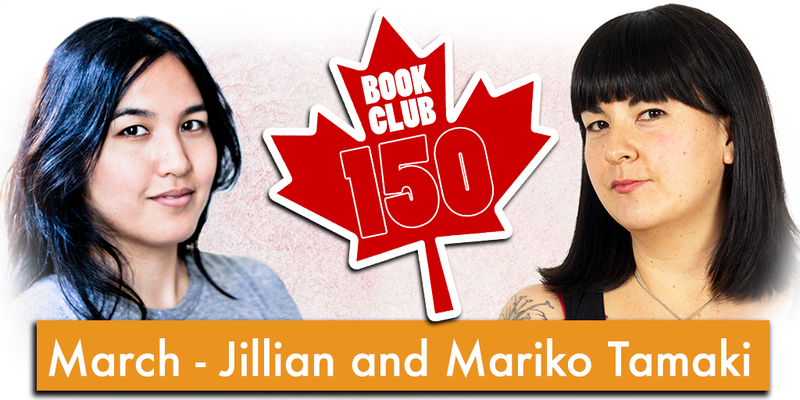 To enter, tag us on Twitter, Facebook, or Instagram with #BookClub150 and tell us, or show us, your favourite Graphic Novel. You may also enter at your local library. Entries must be received by midnight, March 31, 2017. Gertie’s leap to greatness / Kate Beasley ; illustrations by Jillian Tamaki. Watch Mariko Tamaki and Jillian Tamaki discuss This One Summer at the 2015 L.A. Times Festival of Books.